The OP-Z may be the hot digital synth of the moment, but it’s also the first consumer music instrument to have dedicated features for live visuals. And that starts with lighting (DMX) and 3D visuals (Unity 3D). One of various surprises about the OP-Z launch is this: there’s a dedicated track for controlling DMX. That’s the MIDI-like protocol that’s an industry standard for stage lighting, supported by lighting instruments and light boards. There’s also integration with Unity 3D, for 2D and 3D animations you can sequence. This integration relies on MIDI, but they’ve gone as far as developing a framework for MIDI-controlled animations. Since Unity runs happily both on mobile devices and beefy desktop rigs, it’s a good match both for doing fun things with your iOS display (which the OP-Z uses anyway), and desktop machines with serious GPUs for more advanced AV shows. We’ll talk to Teenage Engineering to find out more about what they’re planning here, because #createdigitalmotion. The post Teenage Engineering OP-Z has DMX track for lighting, Unity 3D integration appeared first on CDM Create Digital Music. 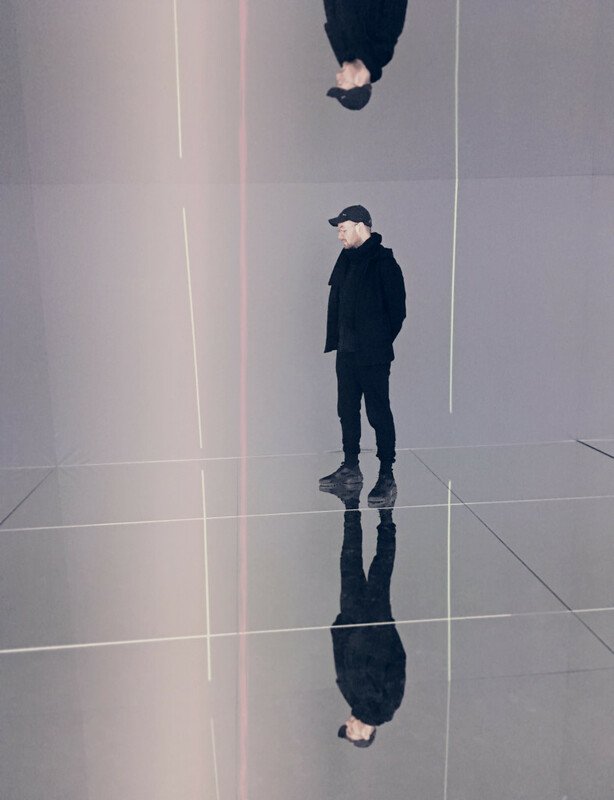 Dutch-born, Danish-based audiovisual artist Zeno van den Broek continues to enchant with his immersive, minimalistic constructions. We talk to him about how his work clicks. Zeno had a richly entrancing audiovisual release with our Establishment label in late 2016, Shift Symm. But he’s been prolific in his work for AV sound, with structures made of vector lines in sight and raw, chest rattling sine waves. It’s abstract an intellectual in the sense of there’s always a clear sense of form and intent – but it’s also visceral, both for the eyes and ears, as these mechanisms are set into motion, overlapping and interacting. They tug you into another world. Zeno is joining a lineup of artists around our Establishment label tonight in Berlin – come round if you see this in time and happen to be in town with us. But wherever you are, we want to share his work and the way he thinks about it. CDM: So you’ve relocated from the Netherlands to Copenhagen – what’s that location like for you now, as an artist or individually? Zeno: Yes, I’ve been living there for little over two years now; it’s been a very interesting shift both personally and workwise. Copenhagen is a very pleasant city to live in – it’s so spacious, green and calm. For my work, it took some more time to feel at home, since it’s structured quite differently from Holland, and interdisciplinary work isn’t as common as in Amsterdam or Berlin. I’ve recently joined a composers’ society, which is a totally new thing to me, so I’m very curious to see where this will lead in the future. Living in such a tranquil environment has enabled me to focus my work and to dive deeper into the concepts behind my work, it feels like a good and healthy base to explore the world from, like being in Berlin these days! Working with these raw elements, I wonder how you go about conceiving the composition. Is there some experimentation process, adjustment? Do you stand back from it and work on it at all? Well, it all starts from the concepts. I’ve been adapting the ‘conceptual art’ practise more and more, by using the ideas as the ‘engine’ that creates the work. For Paranon, this concept came to life out of the desire to deepen my knowledge of sine waves and interference, which always play a role in my art but often more in an instinctive way. 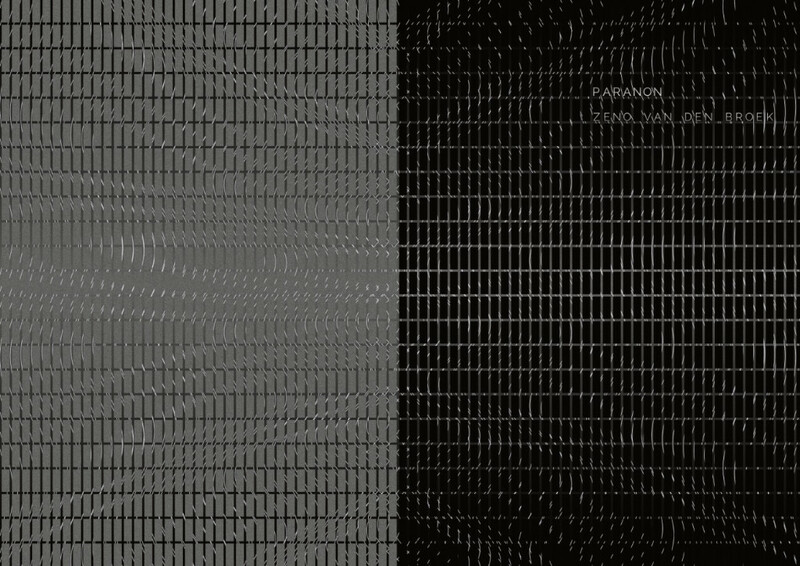 Before I created a single tone of Paranon I did more research on this subject and discovered the need for a structural element in time: the canon, which turned out to a very interesting method for structuring sine wave developments and to create patterns of interference that emerge from the shifting repetitions. Based on this research, I composed canon structures for various parameters of my sine wave generators, such as frequency deviation and phase shifting, and movements of visual elements, such as lines and grids. After reworking the composition into Ableton, I pressed play and experienced the outcome. It doesn’t make sense to me to do adjustments or experiment with the outcome of the piece because all decisions have a reason, related to the concept. To me, those reasons are more important than if something sounds pleasant. If I want to make changes, I have to go back to the concept, and see where my translation from concept to sound or image can be interpreted differently. There’s such a strong synesthetic element to how you merge audio and visual in all your works. Do you imagine visuals as you’re working with the sound? What do they look like? I try to avoid creating an image based on the sound. To me, both senses and media are equally important, so I treat them equally in my methods, going from concept to creation. Because I work with fundamental elements in both the visuals and the sound — such as sine waves, lines, grids, and pulses — they create strong relationships and new, often unexpected, results appear from the merging of the elements. Can you tell us a bit about your process – and I think this has changed – in terms of how you’re constructing your sonic and visual materials? Yes, that’s true; I’ve been changing my tools to better match my methods. Because of my background in architecture, drawing was always the foundation of my work — to form structures and concepts, but also to create the visual elements. 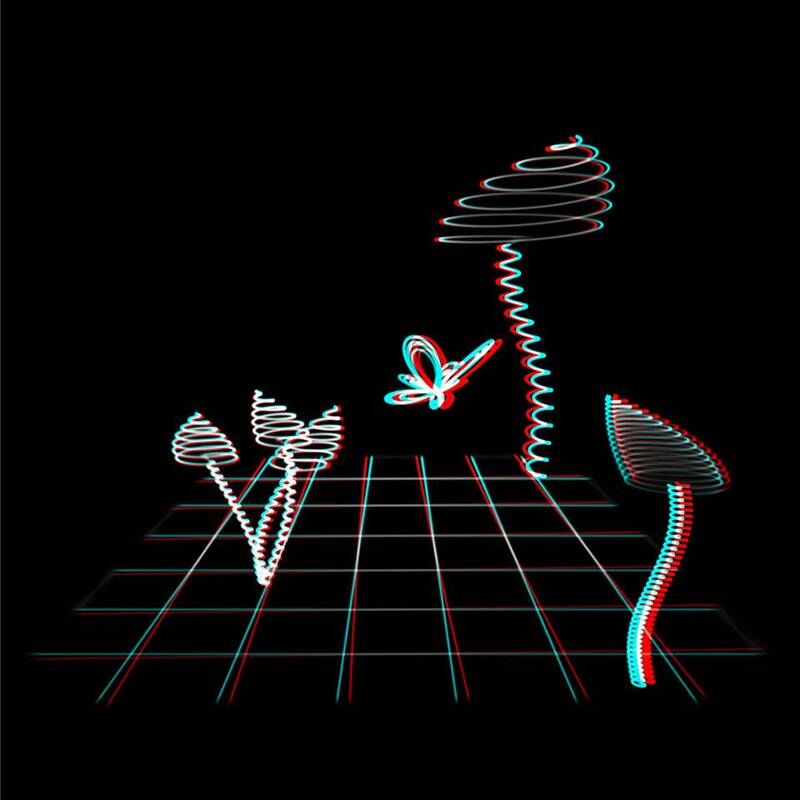 My audiovisual work Shift Symm was still mainly built up out of animated vector drawings in combination with generative elements. But I’ve been working on moving to more algorithmic methods, because the connection to the concepts feels more natural and it gives more freedom, not being limited by my drawing ability and going almost directly from concept to algorithm to result. So I’ve been incorporating more and more Max in my Ableton sets, and I started using [Derivative] TouchDesigner for the visuals. 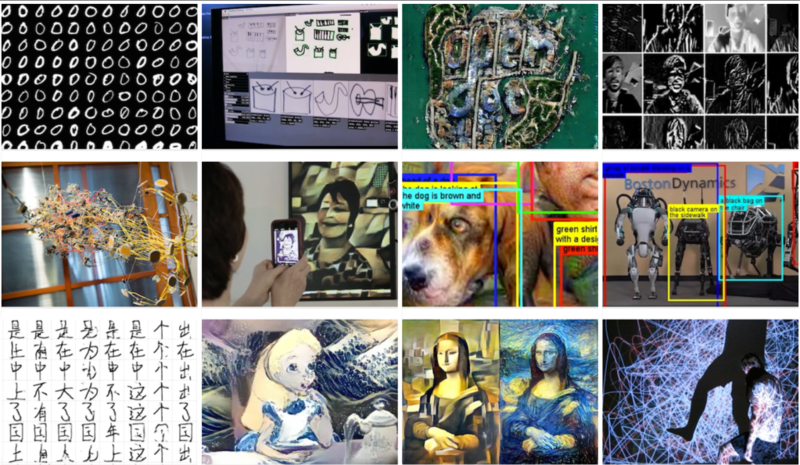 So Paranon was completely generated in TouchDesigner. You’ve also been playing out live a lot more. What’s evolving as you perform these works? Live performances are really important to me, because I love the feeling of having to perform a piece on exactly that time and place, with all the tension of being able to f*** it up — the uncompromising and unforgiving nature of a performance. This tension, in combination with being able to shape the work to the acoustics of the venue, make a performance into something much bigger than I can rationally explain. It means that in order to achieve this I have to really perform it live: I always give myself the freedom to shape the path a performance takes, to time various phrases and transitions and to be able to adjust many parameters of the piece. This does give a certain friction with the more rational algorithmic foundation of the work but I believe this friction is exactly what makes a live performance worthwhile. So on our release of yours Shift Symm, we got to play a little bit with distribution methods – which, while I don’t know if that was a huge business breakthrough, was interesting at least in changing the relationship to the listener. Where are you currently deploying your artwork; what’s the significance of these different gallery / performance / club contexts for you? Yes our Shift Symm release was my first ‘digital only’ audiovisual release; this new form has given me many opportunities in the realm of film festivals, where it has been screened and performed worldwide. I enjoy showing my work at these film festivals because of the more equal approach to the sound and image and the more focused attention of the audience. But I also enjoy performing in a club context a lot, because of the energy and the possibilities to work outside the ‘black box’, to explore and incorporate the architecture of the venues in my work. It strikes me that minimalism in art or sound isn’t what it once was. Obviously, minimal art has its own history. 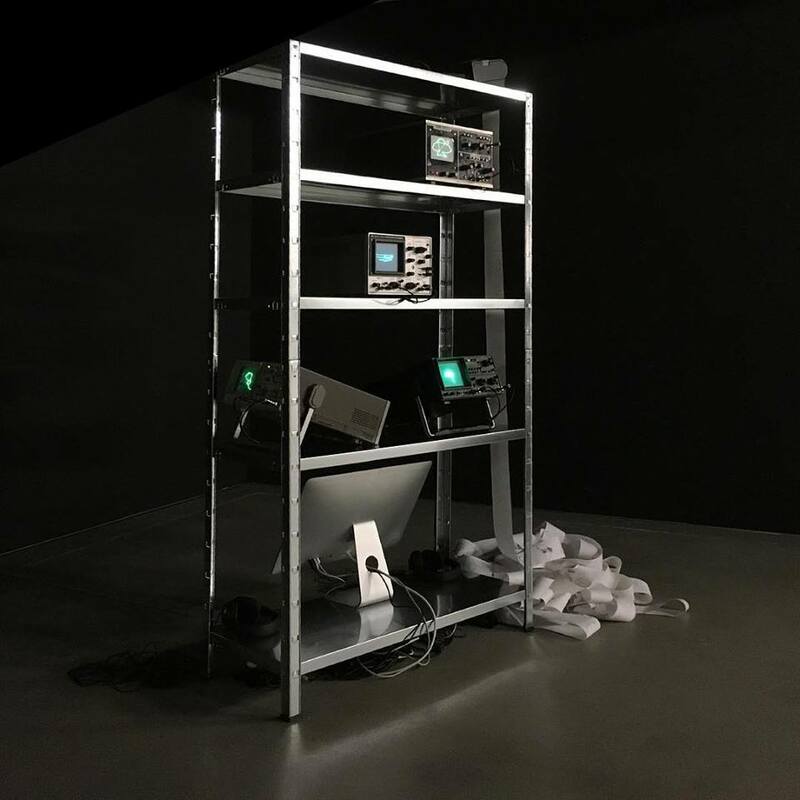 And I got to talk to Carsten Nicolai and Olaf Bender at SONAR a couple years back about the genesis of their work in the DDR – why it was a way of escaping images containing propaganda. What does it mean to you to focus on raw and abstract materials now, as an artist working in this moment? Is there something different about that sensibility – aesthetically, historically, technologically – because of what you’ve been through? 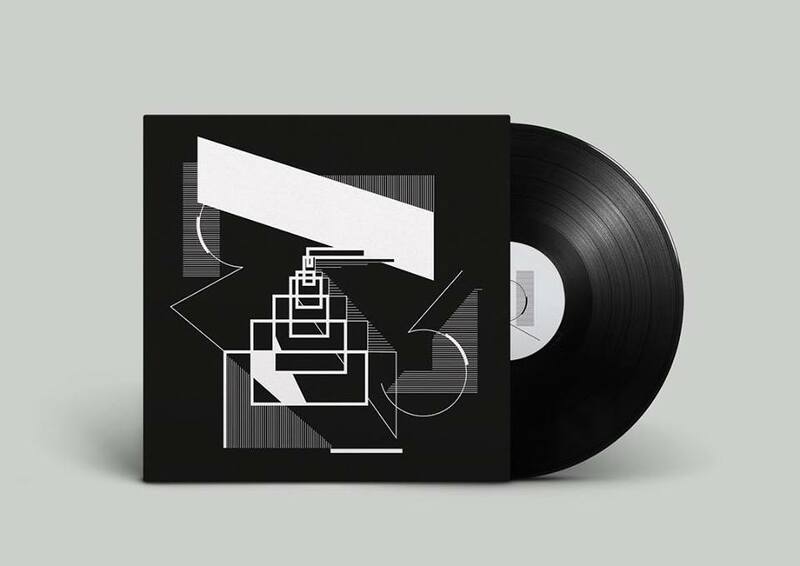 I think my love for the minimal aesthetics come from when I worked as an architect in programs like Autocad — the beautiful minimalistic world of the black screen, with the thin monochromatic lines representing spaces and physical structures. And, of course, there is a strong historic relation between conceptual art and minimalism with artists like Sol LeWitt. But to me, it most strongly relates to what I want to evoke in the person experiencing my work: I’m not looking to offer a way to escape reality or to give an immersive blanket of atmosphere with a certain ambiance. I’m aiming to ‘activate’ by creating a very abstract but coherent world. It’s one in which expectations are being created, but also distorted the next moment — perspectives shift and the audience only has these fundamental elements to relate to which don’t have a predefined connotation but evoke questions, moments of surprise, and some insights into the conceptual foundation of the work. The reviews and responses I’m getting on a quite ‘rational’ and ‘objective’ piece like Paranon are surprisingly emotional and subjective, the abstract and minimalistic world of sound and images seemingly opens up and activates while keeping enough space for personal interpretation. What will be your technical setup in Berlin tonight; how will you work? 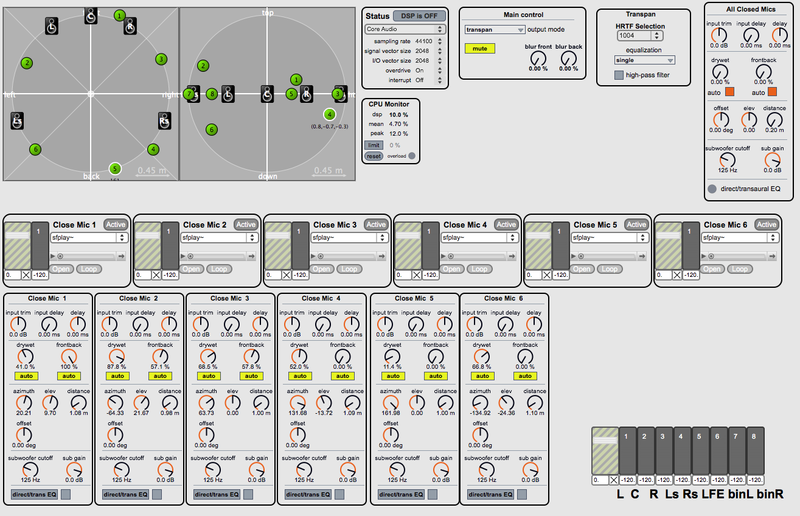 For my Paranon performance in Berlin, I’ll work with custom-programmed sine wave generators in [Cycling ’74] Max, of which the canon structures are composed in Ableton Live. These structures are receive messages via OSC and audio signal is sent to TouchDesigner for the visuals. On stage, I’m working with various parameters of the sound and image that control fundamental elements of which the slightest alteration have a big impact in the whole process. Besides performing and screening my audiovisual pieces such as Paranon and Hysteresis, I’m working on two big projects. One is an ongoing concert series in the Old Church of Amsterdam, where the installation Anastasis by Giorgio Andreotta Calò filters all the natural light in the church into a deep red. In June, I’ve performed a first piece in the church, where I composed a short piece for organ and church bells and re-amplified this in the church with the process made famous by Alvin Lucier’s “I’m sitting in a room” — slowly forming the organ and bells to the resonant frequencies of the church. In August, this will get a continuation in a collaboration with B.J. Nilsen, expanding on the resonant frequencies and getting deeper into the surface of the bells. The other project is a collaboration with Robin Koek named Raumklang: with this project, we aim to create immaterial sound sculptures that are based on the acoustic characteristics of the location they will be presented in. Currently, we are developing the technical system to realize this, based on spatial tracking and choreographies of recording. In the last months, we’ve done residencies at V2 in Rotterdam and STEIM in Amsterdam and we’re aiming to present a first prototype in September. Thanks, Zeno! Really looking forward to tonight! 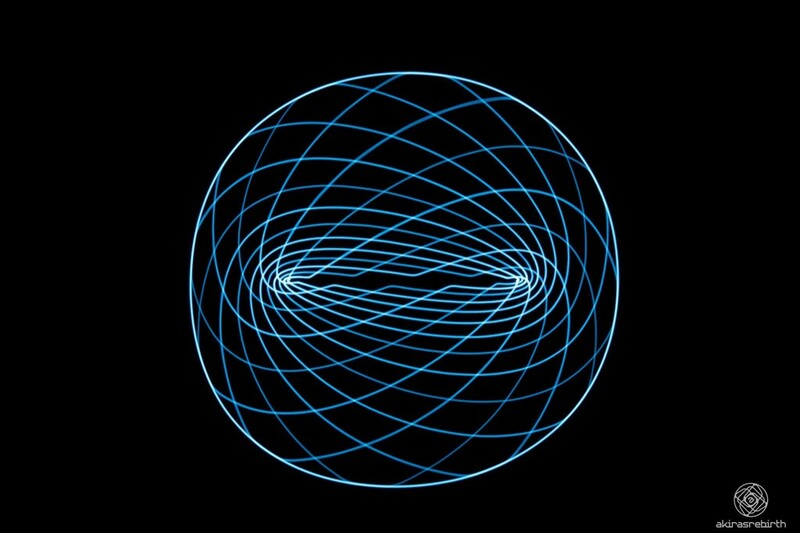 The post Moving AV architectures of sine waves: Zeno van den Broek appeared first on CDM Create Digital Music. Integrated sound-image systems have been a fascination of the avant-garde through the history of electronic art. But if there’s a return to the raw signal, maybe that’s born of a desire to regain a sense of fusion of media that can be lost in overcomplicated newer work. And SIGINT, Oliver Dodd’s project, is one of the more compelling releases in that series. It debuted over the winter, but now feels a perfect time to delve into what it’s about – and some of Oliver’s other, evocative work. The concept of SIGINT is based on the idea of scanning, searching, and recording satellite transmissions in the pursuit of capturing what appear to be anomalies as intelligent signals hidden within the transmission spectrum. 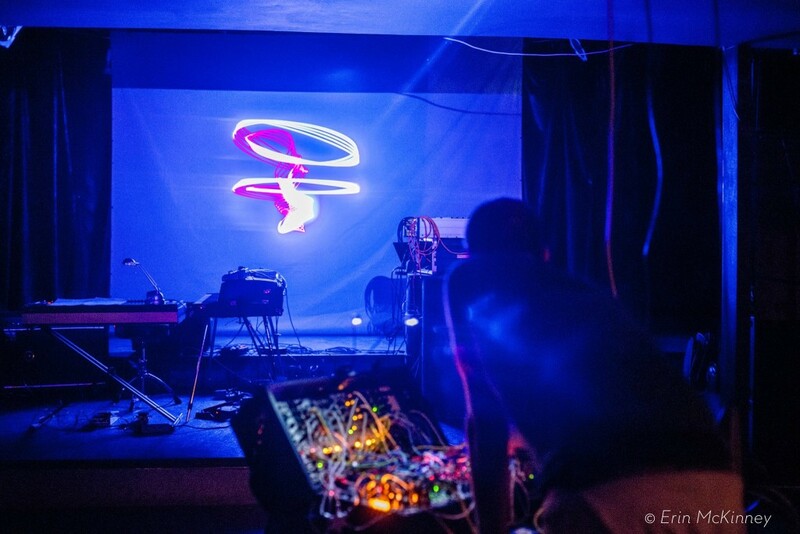 SIGINT represents these raw recordings, captured in their live, original form. These audio-video recordings were performed and rendered to VHS in real-time in an attempt to experience, explore, decipher, study, and decode this deeply evocative, secret, and embedded form of communication whose origins appear both alien and unknown, like paranormal imprints or reflections of inter-dimensional beings reflected within the transmission stream. The amazing thing about this project are the synchronicities formed between the audio and the video in real time. By connecting with the aural and the visual in this way, one generates and discovers strange, new, and interesting communications and compositions between these two spaces. The Modular Audio/Video system allows a direct connection between the video and the audio, and vice versa. A single patch cable can span between the two worlds and create new possibilities for each. 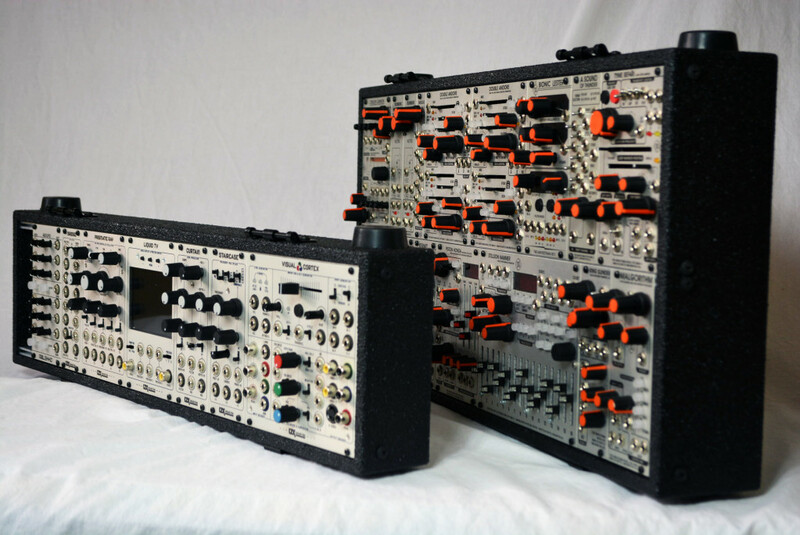 The modular system used for SIGINT was one 6U case of only Industrial Music Electronics (Harvestman) modules for audio and one 3U case of LZX Industries modules for video. CDM: I’m going through all these lovely experiments on your YouTube channel. How do these experiments come about? Oliver: My Instagram and YouTube content is mostly just a snapshot of a larger picture of what I am currently working on, either that day, or of a larger project or work generally, which could be either a live performance, for example, or a release, or a video project. That’s one hell of an AV modular system. Can you walk us through the modules in there? What’s your workflow like working in an audiovisual system like this, as opposed to systems (software or hardware) that tend to focus on one medium or another? It’s a two-part system. There is one part that is audio (Industrial Music Electronics, or “Harvestman”), and there is one part that is video (LZX Industries). They communicate with each other via control voltages and audio rate signals, and they can independently influence each other in both ways or directions. For example, the audio can control the video, and the control voltages generated in the video system can also control sources in the audio system. Many of the triggers and control voltages are shared between the two systems, which creates a cohesive audio/video experience. However, not every audio signal that sounds good — or produces a nice sound — looks good visually, and therefore, further tweaking and conditioning of the voltages are required to develop a more cohesive and harmonious relationship between them. The two systems: a 3U (smaller) audio system on the left handles the Harvestman audio modules, and 6U (taller) on the right includes video processing modules from LZX Industries. Cases designed by Elite Modular. I’m curious about your notion of finding patterns or paranormal in the content. Why is that significant to you? Carl Sagan gets at this idea of listening to noise in his original novel Contact (using the main character listening to a washing machine at one point, if I recall). What drew you to this sort of idea – and does it only say something about the listener, or the data, too? Data transmission surrounds us at all times. There are always invisible frequencies that are outside our ability to perceive them, flowing through the air and which are as unobstructed as the air itself. We can only perceive a small fraction of these phenomena. There are limitations placed on our ability to perceive as humans, and there are more frequencies than we can experience. There are some frequencies we can experience, and there are some that we cannot. Perhaps the latter can move or pass throughout the range of perception, leaving a trail or trace or impressions on the frequencies that we can perceive as it passes through, and which we can then decode. What about the fact that this is an audiovisual creation? What does it mean to fuse those media for a project? The amazing thing about this project are the synchronicities formed between the audio and the video in real time. By connecting with the aural and the visual in this way, one generates and discovers strange, new, and interesting communications and compositions between these two spaces. The modular audio/video system allows direct connection between the video and the audio, and vice versa. A single patch cable can span between the two worlds and create new possibilities for each. If this were a less cruel world, the YouTube algorithm would only feed you this. But in the meantime, you can subscribe to his channel. And ignore the view counts, actually. One person watching this one video is already sublime. Plus, from Oliver’s gorgeous Instagram account, some ambient AV sketches to round things out. The post Speaking in signal, across the divide between video and sound: SIGINT appeared first on CDM Create Digital Music. DSI / 8Dio Sequential Prophet X Official Add-On Series: "Across The Star Lake"
I got the chance to go behind the scenes in discussion with the team organizing, as well as some of the artists, to try to understand both how the system works technically and what the artistic intention of launching a new delivery platform. 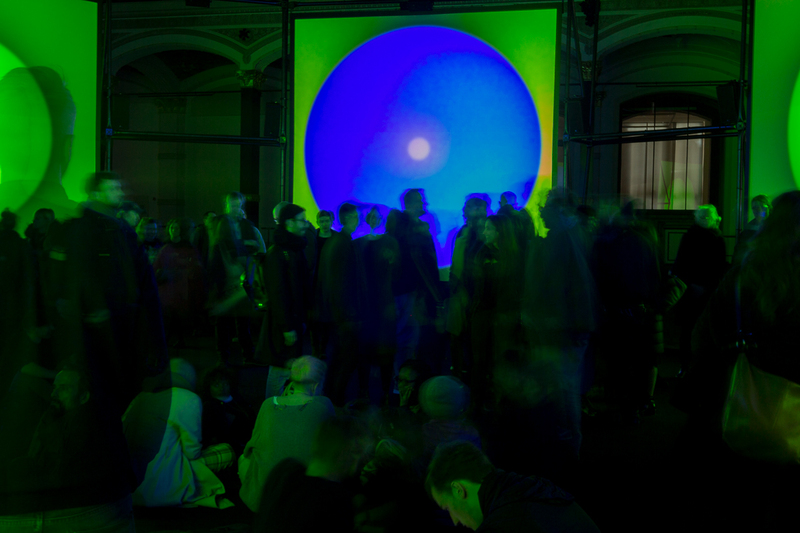 Brian Eno and Peter Chilvers present the debut work on the system – from earlier today. Photo courtesy ISM. It’s not that immersive projection and sound is anything new in itself. Even limiting ourselves to the mechanical/electronic age, there’s of course been a long succession of ideas in panoramic projection, spatialized audio, and temporary and permanent architectural constructions. You’ve got your local cineplex, too. But as enhanced 3D sound and image is more accessible from virtual and augmented reality on personal devices, the same enhanced computational horsepower is also scaling to larger contexts. And that means if you fancy a nice date night instead of strapping some ugly helmet on your head, there’s hope. But if 3D media tech is as ubiquitous and your phone, cultural venues haven’t kept up. Here in Germany, there are a number of big multichannel arrays. But they’ve tended to be limited to institutions – planetariums, academies, and a couple of media centers. So art has remained somewhat frozen in time, to single cinematic projections and stereo sound. The projection can get brighter, the sound can get louder, but very often those parameters stay the same. And that keeps artists from using space in their compositions. For now, ISM just has the Hexadome, so it’s parked in the large atrium of the Martin Gropius Bau, a respected museum in the heart of town. Michael Tan’s design for CAO. Brian Eno’s installation launches a series of works that simply play back on the system, though the experience is still similar – you wander in and soak in projected images and spatial sound. The other artists all contributed installation versions of their work, plus a collaboration between Tarik Barri and Thom Yorke. But before we get to the content, let’s consider the system and how it works. The two halves of the Hexadome describe what this is – it’s a hexagonal projection arrangement, plus a dome-shaped sound array. I spoke to Holger Stenschke, Lead Support Technician, from ZKM Karlsruhe, as well as Toby Götz, director of the Pfadfinderei collective. (Toby doubles up here, as the designer of the visual installation, and as one of the visual artists.) So they filled me in both on technical details and the intention of the whole thing. 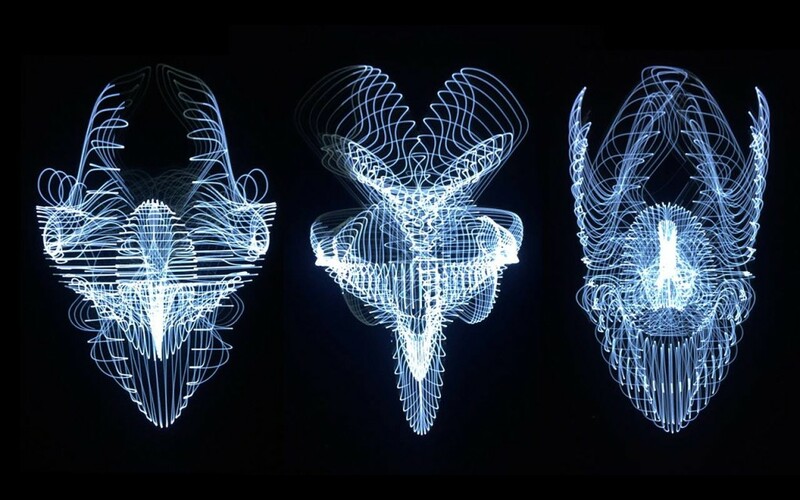 Jemma Woolmore shares this in-progress image of her visuals, as mapped to those six screens. Sound. In the hemispherical sound array, there are 52 Meyer Sound speakers, arranged on a frame that looks a bit like a playground jungle gym. Why 52? Well, they’re arranged into a triangular tesselation around the dome. That’s not just to make this look impressive – that means that the sound dispersal from the speakers line up in such a way that you cover the space with sound. Audio interfaces. MOTU are all over this rig, because of AVB. AVB is the standard (IEEE, no less) for pro audio networking, letting you run sound over Ethernet connections. AVB audio interfaces from MOTU are there to connect to an AVB network that drives all those individual speakers. Sound spatialization software. Visualists here are pretty much on their own – your job is to fill up those screens. But on the auditory side, there’s actually some powerful and reasonably easy to understand software to guide the process of positioning sound in space. It’s actually significant that the Hexadome isn’t proprietary. Whereas the 4DSOUND system uses its own bespoke software and various Max patches, the Hexadome is built on some standard tools. 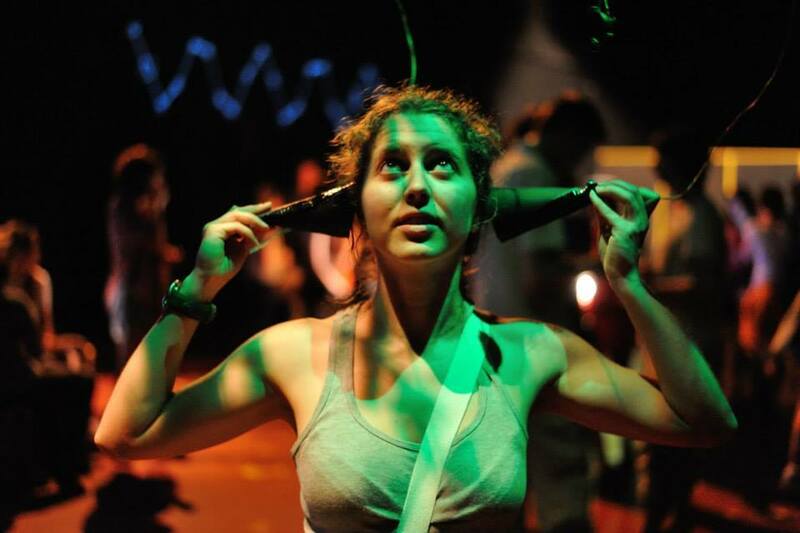 Artists have a choice between IRCAM’s Panoramix and Spat, and ZKM’s Zirkonium. On the IRCAM side, there’s not so much one toolchain as a bunch of smaller tools that work in concert. Panoramix is the standalone mixing tool an artist is likely to use, and it works with, for example, JACK (so you can pipe in sound from your software of choice). 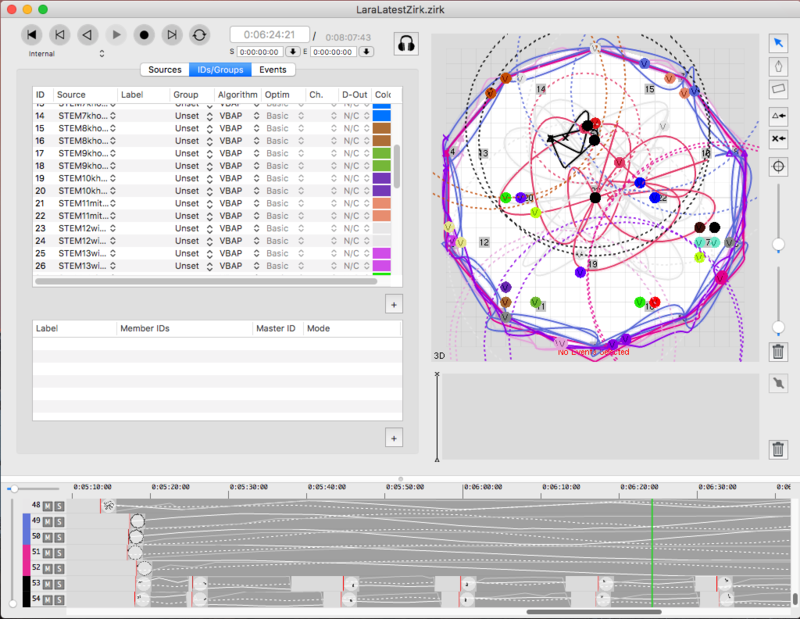 Then Spat comprises Max/MSP implementation of IRCAM spatialization, perception, and reverb tools. Panoramix is deep software – you can choose per sound source to use various spatialization techniques, and the reverb and other effects are capable of some terrific sonic effects. Then it’s a matter of whether the works are made for an installation, in which case they’re typically rendered (“freezing” the spatialization information) and played back in Reaper, or if they’re played live. For live performance, artists might choose to control the spatialization engine by sending OSC data, and using some kind of tool as a remote control (an iPad, for example). Holger tells CDM that the team worked to mediate this effect by precisely positioning speakers in such a way that, once you’re inside the “dome” area, you hear mainly direct sound. In addition, a multichannel reverb like the IRCAM plug-in can be used to tune virtualized early reflections, making reverberation seem to emanate from beyond the dome. In Eno’s work, at least, you have a sense of being enveloped in gong-like tones that emerge from all directions, across distances. You hear the big reverb tail of the building mixed in with that sound, but there’s a blend of virtual and real space – and there’s still a sense of precise distance between sounds in that hemispherical field. That’s hard to describe in words, but think about the leap from mono to stereo. While mono music can be satisfying to hear, stereo creates a sense of space and makes individual elements more distinct. There’s a similar leap when you go to these larger immersive systems, and more so than the cartoonish effects you tend to get from cinematic multichannel – or even the wrap-around effects of four-channel. Okay, so that’s all well and good. But everything I’ve described – multi-4K projection, spatial audio across lots of speakers – is readily available, with or without the Hexadome per se. You can actually go download Zirkonium and Panoramix right now. (You’ll need a few hundred euros if you want plug-in versions of all the fancy IRCAM stuff, but the rest is a free downloads, and ZKM’s software is even open source.) You don’t even necessarily need 50 speakers to try it out – Panoramix, for instance, lets you choose a binaural simulation for trying stuff out in headphones, even if it’ll sound a bit primitive by comparison. The Hexadome for now has two advantages: one, this program, and two, the fact that it’s going mobile. Plus, it is a particular configuration. The six square screens may at first seem unimpressive, at least in theory. You don’t get the full visual effect that you do from even conventional 180-degree panoramic projection, let alone the ability to fill your visual field as full domes or a big IMAX screen can do. Speaking to the team, though, I understood that part of the vision of the Hexadome was to project what Toby calls “windows.” And because of the brightness and contrast of each, they’re still stunning when you’re there with them in person. This fits Eno’s work nicely, in that his collaboration with Peter Chilvers projects gallery-style images into the space, like slowly transforming paintings in light. The gaps between the screens and above mean that you’re also aware of the space you’re in. So this is immersive in a different sense, which fits ISM’s goal of inserting these works in museum environments. The question “why” is actually harder to answer. There wasn’t a clear statement of mission from ISM and the Hexadome and its backers – this thing is what it is because they wanted it to be what it is, essentially. There’s no particular curatorial theme to the works. They touted some diversity of established and emerging artists. Though just about anyone may seem like they’re emerging next to Eno, that includes both local Berlin and international artists from Peru and the USA, among others, and a mix of ages and backgrounds. The overall statement launching the Hexadome was therefore of a blank canvas, which will be approached by a range of people. And Eno/Chilvers made it literally seem a canvas, with brilliantly colored, color field-style images, filling the rectangles with oversized circles and strips of shifting color. 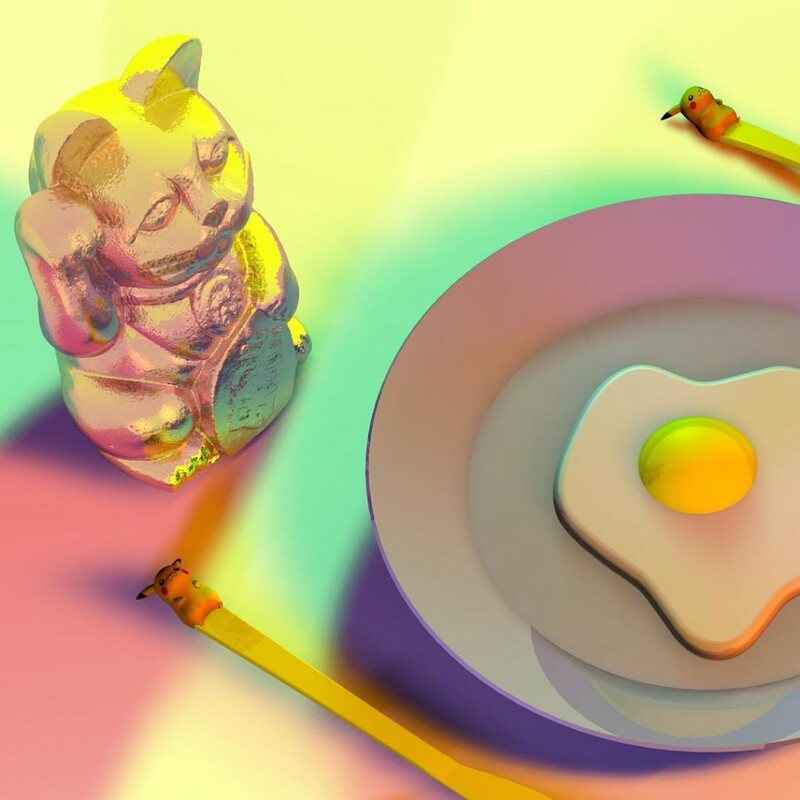 Chilvers uses a slightly esoteric C++ raytracing engine, generating those images in realtime, in a digital, generative, modern take on the kind of effects found in Georges Seurat. Eno’s sounds were precisely what you’d expect – neutral chimes and occasional glitchy tune fragments, floating on their own or atop gentle waves of noise that arrive and recede like a tide. Organic if abstract tones resonated across the harmonic series, in groupings of fifths. Both image and sound are, in keeping with Eno’s adherence to stochastic ideas, produced in real-time according to a set of parameters, so that nothing ever exactly repeats. These are not ideas originated by Eno – stochastic processes and chance operations obviously have a long history – but as always, his rendition is tranquil and distinctively his own. What strikes me about beginning with Eno is that it sets a controlled tone for the installation. 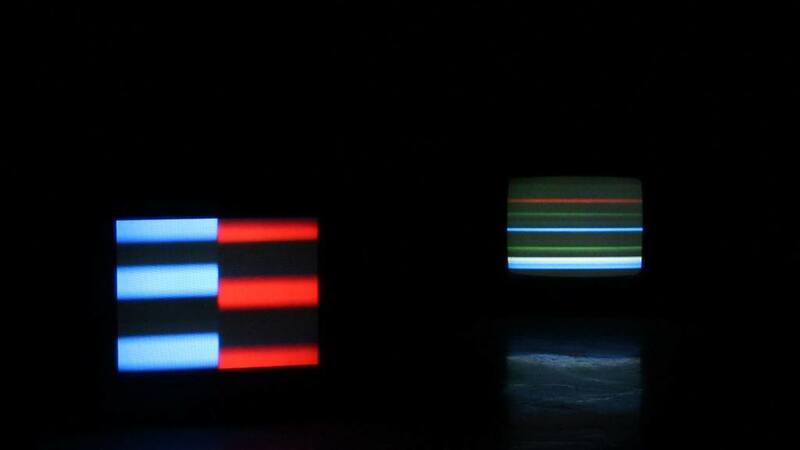 Eno/Chilvers’ aesthetic was at home on this system; the arrangement of screens fit the set of pictures, and Eno’s music is organic enough that when it’s projected into space, it seems almost naturally occurring. And Eno in a press conference found a nice metaphor for justifying the connection of the Hexadome’s “windows” to the gallery experience. He noted that Chilvers’ subtly-shifting, ephemeral color compositions exploded the notion of painting or still image as something that could be consumed as a snapshot. Effectively, their work suggests the raison d’etre that the ISM curators seemed unable to articulate. 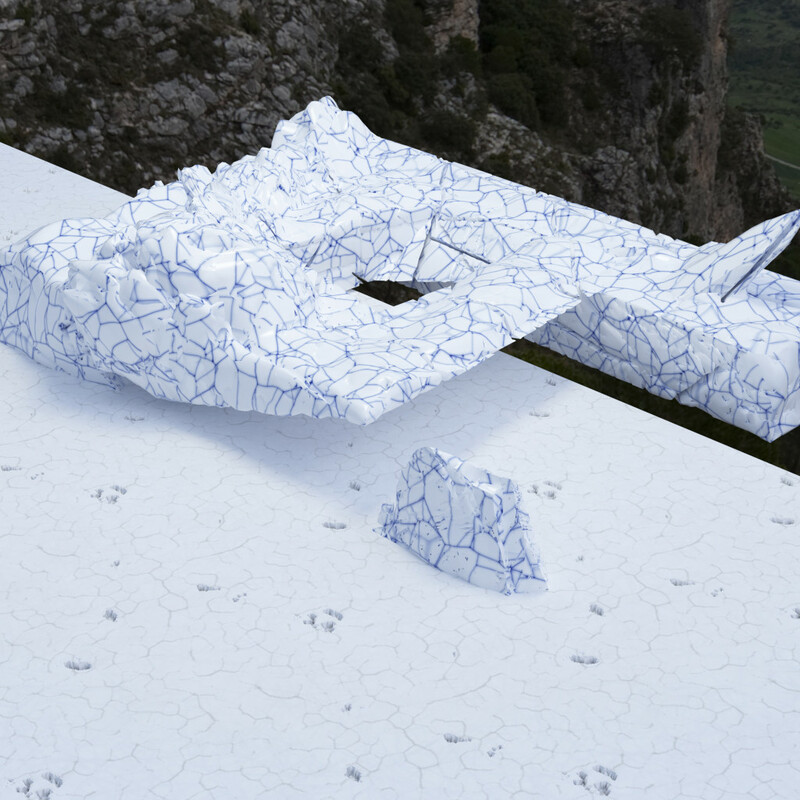 The Hexadome is a canvas that incorporates time. But that also raises a question. If spatial audio and immersive visuals have often been confined to institutions, this doesn’t so much liberate them as make a statement as to how museums can capitalize on deploying them. An inward-looking set of square images also seems firmly rooted in the museum frame (literally). And the very fact that Eno’s work is so comfortable sets the stage for some interesting weeks. Now we’ll see whether the coming lineup can find any subversive threads with the same setup, and in the longer run, what comes of this latest batch of installations. Will these sorts of setups incubate new ideas – especially as there’s a mix of artists and engineers engaged in the underlying tech? Or will spend-y installations like the Hexadome simply be a showy way to exhibit the tastes of big institutional partners? With some new names on that lineup for the coming weeks, I think we’ll at least get some different answers to where this could go. And looking beyond the Hexadome, the power of today’s devices to drive spatialization and visuals more easily means there’s more to come. Stay tuned. In coming installments, I’ll look deeper at some of these tools, and talk to some of the up-and-coming artists doing new things with the Hexadome. 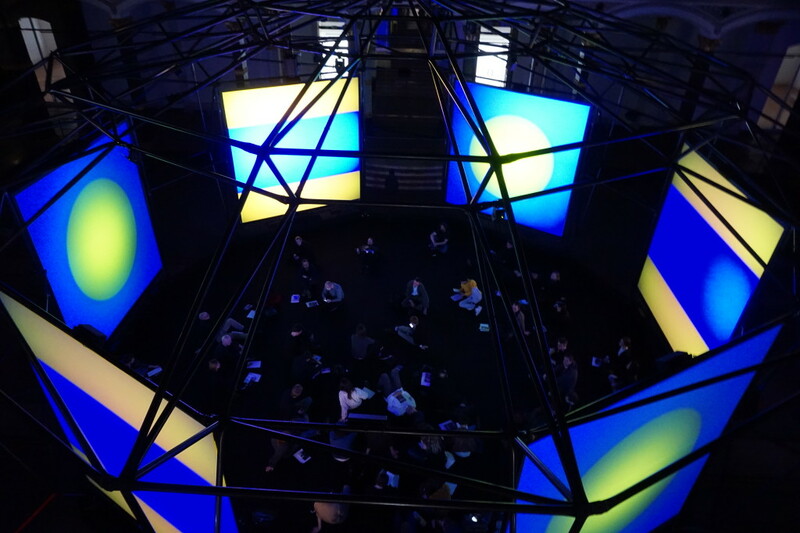 The post Inside a new immersive AV system, as Brian Eno premieres it in Berlin appeared first on CDM Create Digital Music. 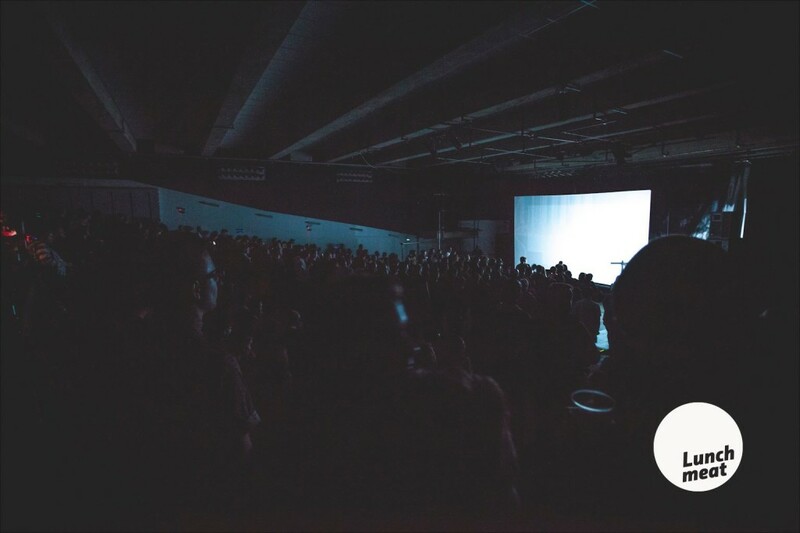 The post Let’s talk craft and vision in live audiovisual performance, media art appeared first on CDM Create Digital Music. Call it stimulated synesthesia: there’s something really satisfying when your brain sees and hears a connection between image and sound. 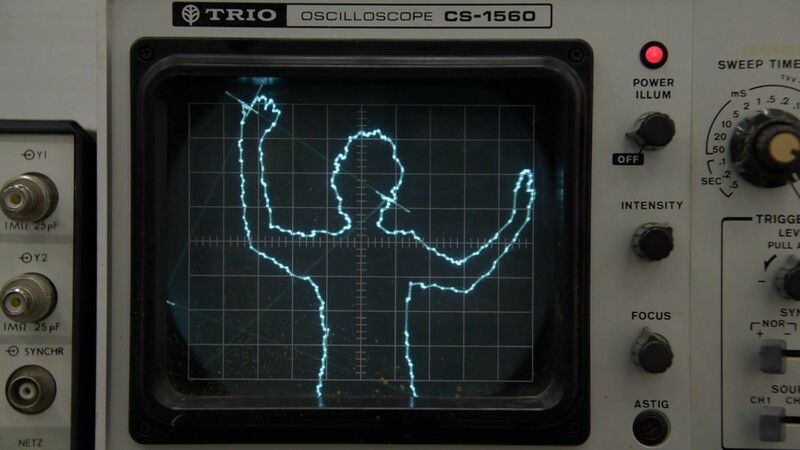 And add some extra magic when the image is on an oscilloscope. A new video series on YouTube shows you how to make this effect yourself. Oooh, my, that’s tasty. Like biting into a big, juicy ripe [vegetarian version] tomato [meat-lovers version] raw steak. So in the tutorial series, Fenderson clues us in to how he makes all this happen. And this could be an economical thing to play around with, as you’ll often find vintage oscilloscopes around a studio or on sale used. Don’t miss the description on YouTube – there are tons of resources in there; it’s practically a complete bibliography on the topic in itself. 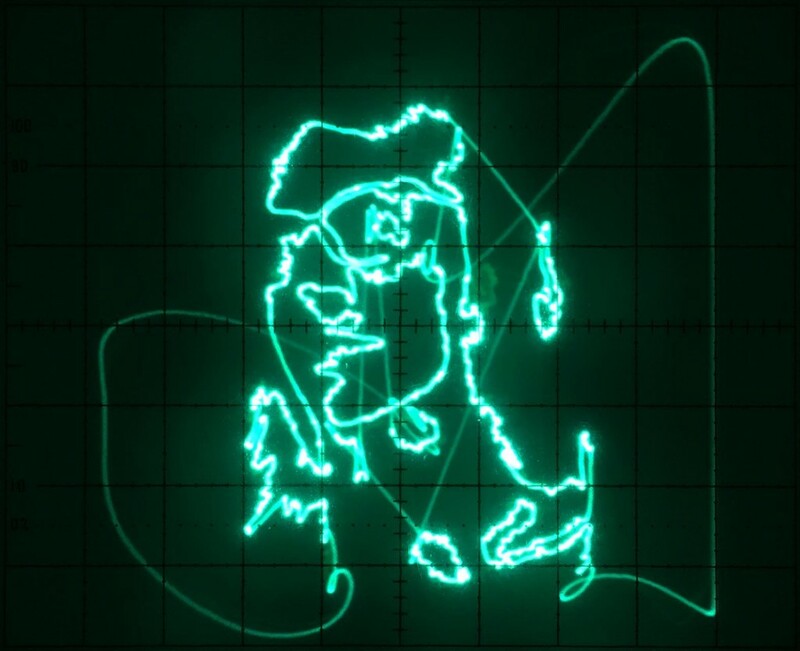 The post Learn how to make trippy oscilloscope music with this video series appeared first on CDM Create Digital Music.